"There are books that cover basic clinical approaches or providea quick referenceguide but for some timethere has been a gap on the bookself for up-to-date, comprehensive, authoritative book...The book is mammoth and replete with high-quality with high-quality colour diagrams...Was it worth carrying this hefty tome with me each day? Absolutely- it clearly conveys information that is not found in other textbooks, along with a good distillation of current knowledge in a reader-friendly format." 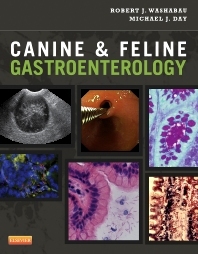 "Canine and Feline Gastroenterology is a comprehensive text of over 950 pages covering diseases of the gastrointestinal tract, as well as the pancreatic and the hepatobillary systems...Canine and Feline and Gastroenterology serves as a must-have reference for both generalist and referral practitioners, as well as postgraduate students with a particular interest in the discipline of veterinarty gastroenterology. It is a valuable resource, which I will continue to use in both clinical and research settings, as well as for preparation for specialist exams, and is a worthwhile addition to the practice library."